Straight from the Death Star escape scene of Episode IV: A New Hope, the all-new LEGO Millennium Falcon. Can you rewrite history and help Ben Kenobi defeat his evil nemesis from the dark side? Straight from the Death Star escape scene of Episode IV: A New Hope, the LEGO Millennium Falcon features stunning details, like hull plates that open to reveal a detailed interior, twin flick missiles, rotating quad laser cannons and detachable cockpit cover. LEGO model number: 7965: Includes Han Solo, Luke Skywalker, Chewbacca, Ben Kenobi, Princess Leia Organa and Darth Vader. Can you rewrite history and help Ben Kenobi defeat his evil nemesis from the dark side? For ages 9 years and over; EAN: 5702014736955. WARNING(S): Not suitable for children under 3 years old. 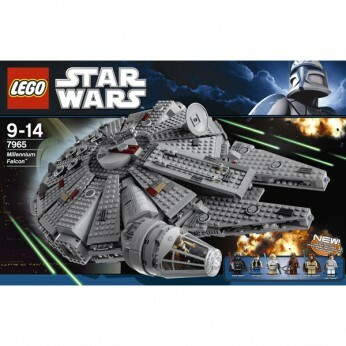 This toy costs approximately £104.99 (for the latest and best prices make sure you check our retailer list for the LEGO Star Wars Millennium Falcon 7965 above). In our review of LEGO Star Wars Millennium Falcon 7965 we classed it as being suitable for ages 6 years, 7 years, 8 years but recommend you check the manufacturer specific advice before purchasing.